I enjoyed the tour very much, especially the drive through the countryside. Great lunch. Absolutely recommended if you want to see the rural area close to Yangon! We absolutely loved the trip in terms of seeing the outskirts of yangon and travelling there via ferry and local transport. Our guide was great and we also got to see a lot of Yangon, local market, enjoy street foods, visit pagodasand mingle with locals. The pottery experience itself was somewhat disappointing. We werent really in a position to try the art ourselves and the opportunity to acquire local pottery was limited. On the up side, a more commercial experience would have taken away from the wonderful skill the population possesses. 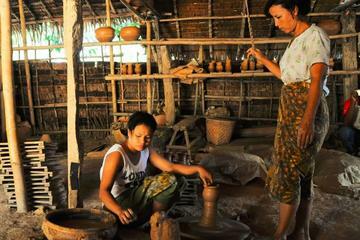 A worthwhile trip, but not necessarily to make your own pottery but rather to see the locals perform their craft. Nice tour with a visit in a pottery, a pagoda, a very special pagoda with snakes and a nice ferry trip.